June ISM Manufacturing — 55.3%, virtually the same as May’s 55.4%. Car Sales — Up just 1.2 percent year-over-year in June, which for some reason was celebrated in the press. The Big Six: GM, +1%; Ford, -6%; Chrysler, +9%; Toyota, +3%; Honda, -6%; Nissan, +5%. Officially, expectations look fairly normal. The consensus on Wall Street is for 215K new jobs, and for the Unemployment Rate to stay steady at 6.3%, with wages plodding along at 0.2%. But some economists are expecting big things. SocGen, for example, thinks we’ll get 290K. Barclays sees 250K. Millan Mulraine of TD Securities said that the Wednesday ADP report offers the possibility of 300K or more new jobs for the month. Hiring was likely robust for a fifth straight month in June, a sign that the economic recovery, now entering its sixth year, is finally gaining meaningful traction. Business Insider’s point about a possible perceived seasonally adjusted “breakout” is well-taken. But it will only mark the beginnings of a genuine breakout if actual (i.e., not seasonally adjusted) additions are 600,000 or more. If that were to occur, it would probably translate to about 375,000 seasonally adjusted jobs. 500,000 actual jobs added would probably translate to about 300,000 seasonally adjusted jobs. The press and the administration would consider that a breakout. I wouldn’t. The report will be here at 8:30 a.m.
… The number of persons employed part time for economic reasons (sometimes referred to as involuntary part-time workers) increased by 275,000 in June to 7.5 million. 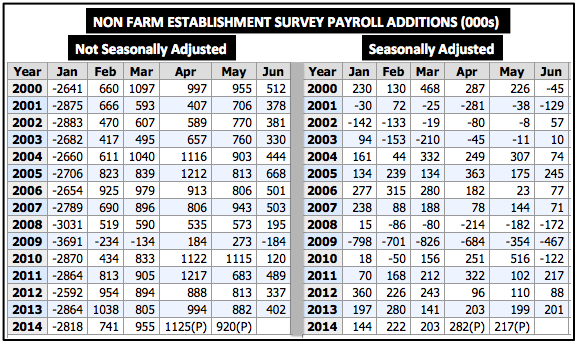 Total nonfarm payroll employment rose by 288,000 in June. Over the past 3 months, job growth has averaged 272,000 per month. In June, employment growth was widespread, led by gains in professional and business services, retail trade, food services and drinking places, and health care. Employment in professional and business services rose by 67,000 in June and had averaged 53,000 per month over the prior 12 months. In June, employment within the industry increased in management and technical consulting services (+8,000), architectural and engineering services (+7,000), and computer systems design and related services (+7,000). Employment continued to trend up in temporary help services (+10,100, a number bigger than all others in this paragraph — it seems that the BLS wouldn’t tell us this because they’re embarrassed, and hopes no one looks up the real number — Ed.). Retail trade employment increased by 40,000 in June. Over the prior 12 months, employment in this industry had grown by an average of 26,000 per month. In June, job growth in the industry occurred in motor vehicle and parts dealers (+12,000), building material and garden supply stores (+8,000), and electronics and appliance stores (+7,000). Employment in food services and drinking places rose by 33,000 in June and has increased by 314,000 over the past year. Health care employment increased by 21,000 in June, about in line with the prior 12-month average gain of 18,000 per month. Within health care, employment continued to trend up in ambulatory health care services (+13,000) and in nursing and residential care facilities (+6,000). Transportation and warehousing employment increased by 17,000 in June. Over the prior 12 months, this industry had added an average of 11,000 jobs per month. In June, couriers and messengers added 6,000 jobs. Financial activities added 17,000 jobs in June, with a gain of 9,000 in insurance carriers and related activities. Employment in real estate and rental and leasing continued to trend up in June (+9,000). 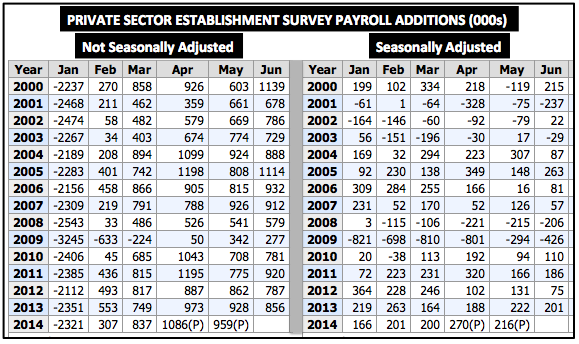 Financial activities had added an average of 5,000 jobs per month over the prior 12 months. Manufacturing added 16,000 jobs in June, with all of the increase in durable goods manufacturing. Within durable goods, employment increased in motor vehicles and parts (+6,000) and in computer and peripheral equipment (+3,000). Wholesale trade added 15,000 jobs over the month and has added 140,000 jobs over the year. … In June, average hourly earnings for all employees on private nonfarm payrolls rose by 6 cents to $24.45, following a 6-cent increase in May. Over the past 12 months, average hourly earnings have risen by 2.0 percent. In June, average hourly earnings of private-sector production and nonsupervisory employees increased by 4 cents to $20.58. - Total nonfarm additions were 582,000 vs. the benchmark of 600,000. - Total private sector additions were 978,000 vs. the benchmark of 1.05 million. That’s about as close as actuals have ever come to yours truly’s benchmarks; you could argue that prior-month revisions put nonfarm payrolls over the top. If we’d see results like these for about six more consecutive months, we might really have something — IF the productivity issue I’m about to raise gets resolved. The anomaly which would seem to refute the idea that the economy may really be contracting is job growth, which, seasonally adjusted, has averaged about 214,000 per month so far this year and was predicted to come in at about the same level in June when this column was submitted. The problem is that job gains are not sufficiently translating into production or income growth. It’s a little premature to theorize about the demoralization which has become the norm among those out of work spreading to those who have jobs — but just barely. More later, after a dive into the detail. Naturally, based on the previous item, the “not in labor force” figure climbed to 92.12 million. The teenage labor force participation rate of 33.9 percent is a full point below June of last year. It went as low as 32.9 percent earlier this year. Call it a one-month anomaly if you want (my gut reaction is that it is, but we’ll have to see in future months), but the number of reported Household Survey part-time workers skyrocketed by 799K, while the number of full-timers fell by 523,000. Temp employment has increased by 216,000 in the past 12 months. Combine temp employment’s 216K in the past 12 months with food and drinking establishments’ 314K (total: 530K), and you have 21% of all payroll employment growth of 2.495 million during the past year coming from segments which until now made up about 9% of the workforce. Another little thing I like to look out is fuel usage. Diesel fuel use was up slightly YoY earlier but it is now below last year’s values. Unless goods are moving via another means, this doesn’t bode well for expansion. Gasoline usage is also an indicator related to tourism. Guess what, it’s about flat YoY for the last 4-8 weeks. That would correspond to what I saw on vacation a few weeks ago, it was supposed to be peak season but it wasn’t crowded at all. On another note, the early heat in the South may help some, as I know that electricity usage is slightly up over last year. However, propane, heating oil, and electricity use was up VERY SIGNIFICANTLY during the 1st quarter of this year…due to the weather. Good point about fuel usage. Commenter dscott is also on that beat. I believe that health care costs and concern about huge deductibles in health are plans is forcing people to rein in their other spending — but they’re still going into more debt. I don’t think it will be long before we hear the admin and press bellowing about stupid people who aren’t spending their money and are wrecking the economy. I’m still digesting the database updates, but, at least on an unadjusted basis, it is no longer accurate to say the LFPR is the worst since 1978. The bad news, unlike last month (when it was merely the worst May since 1979), the 63.35% June 2014 is the worst June since 1976. Similarly, the July-December 2013 LFPRs were the worst for each month since the same months in 1977. The ugly – the July-December 2014 LFPRs are on track to come in as the worst since 1976. #2, thanks for the hat tip. first-quarter productivity fell by an annualized 3.5 percent. If workers collectively produce less, it doesn’t matter how many of them there are. GDP will still decline. the number of reported Household Survey part-time workers skyrocketed by 799K, while the number of full-timers fell by 523,000. Does it not stand to reason that the loss of disposable income in itself is a negative to the GDP? Surely the reduction in the ability to spend from going to full timer to part timer is a given…However, IF 799k unemployed people got part time jobs, i.e. getting off unemployment benefits and additionally 523k full timers become unemployed receiving those benefits, it stands to reason that the net negative is actually greater since there were a larger group surviving on unemployment benefits getting part time jobs that probably is minimally higher increase than the benefit itself. The under unemployed basically received a slap on the back for doing something but not much more. While the big spenders lost their jobs. Furthermore just as the spin off jobs multiplier adds jobs for every full time position, there would necessarily be a negative jobs multiplier for every lost full time position. That multiplier would clearly be significantly greater for the full time vs part time position. It may even be zero for the part timer. The real issue here is the LOSS of income disparity if you take out the 1%. Obama’s policies make everyone equally poor except for his crony AGW/green followers. The Chinese gave up on that paradigm decades ago and there was an explosion of economic growth.